For several years I have been using various species of dead leaves in my aquariums. It all started with a large brown leaf that I seen lying on the substrate of a dealer’s tank many years ago. I was curious about its purpose and the shop staff told me that the fish exporter always packed a few of these leaves in the bags of some of the more sensitive fish. The only information they could provide was that the leaves apparently helped the fish through importation because they contain some sort of medicinal properties. My curiosity was piqued and I was given a few of the leaves for free because they normally just got binned by the shop. I took them home and added them to one of my own tanks where they gradually disappeared and I never gave them a second thought. Several years later I recognised the same distinctive leaves on an Internet auction site being sold as ‘Indian Almond Leaves’ and after reading the blurb I thought I would try a few to see if the now extensive claims about the leaves having special properties were true. After early positive results and more research, I then went on to collecting leaves from local woodlands to experiment with their usefulness for aquariums. After all, I had been using local tree’s roots as decoration for my aquariums, so why not their leaves? 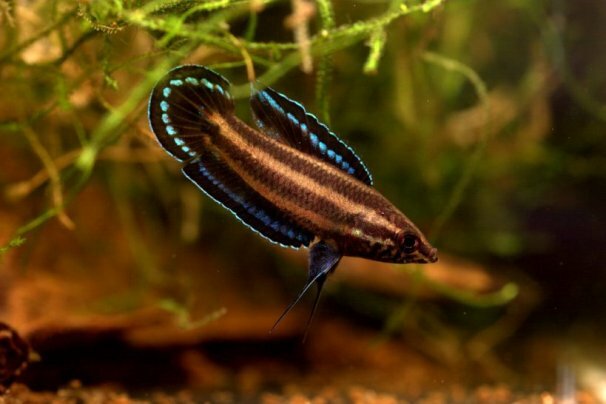 I now make sure that I have dead leaves in every one of my aquariums in which I keep fish from blackwater habitats such as my wild Bettas, Apistogrammas, Badis, wild angels and Uaru fernandezyepeziand with other species too, especially when they have fry. With my fulltime job as a countryside ranger I visit many different habitats in the local area and I have access to many different species of trees – not all of which are native to Scotland. So far, I have used leaves from pendunculate oak Quercus robur, sessile oak Q. petraea, Turkey oak Q. cerris, red oak Q. rubra, European beech Fagus sylvatica, hawthorn Crataegus monogyna and Japanese maple Acer palmatum. The cones from European alder Alnus glutinosa have also proven to be worthy of addition. These trees are just a very small selection of what I could potentially try and hopefully I will have positive results from other species in the future. Obviously I am in Scotland and this is an international website, but the worldwide possibilities would be almost endless so wherever you are at this current moment there should be something nearby of use to you. However, please extend some caution here before trying “any old leaf” and avoid species that are known to be poisonous. Chances are that some fish commonly associated with home aquaria, such as discus, would possibly never even encounter an aquatic plant in their whole life in the wild. 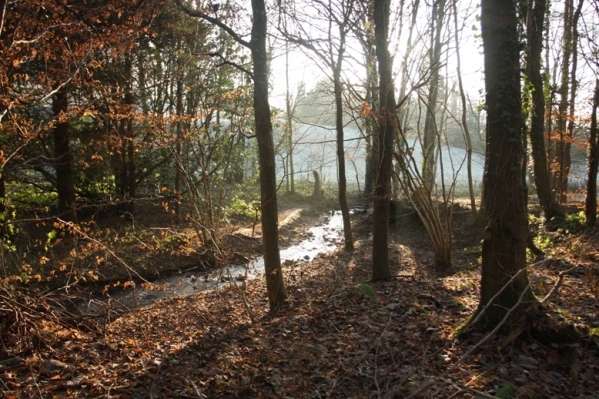 This is especially true of blackwater habitats where the exceptionally acidic water makes the water mostly unsuitable for plants. There would be no lush green carpets, no stands of foliage and certainly no sparkly clean water that any bottled-water company would be proud of. Many of these fish are more likely to be up to their gills in leaf litter and brown-stained water. 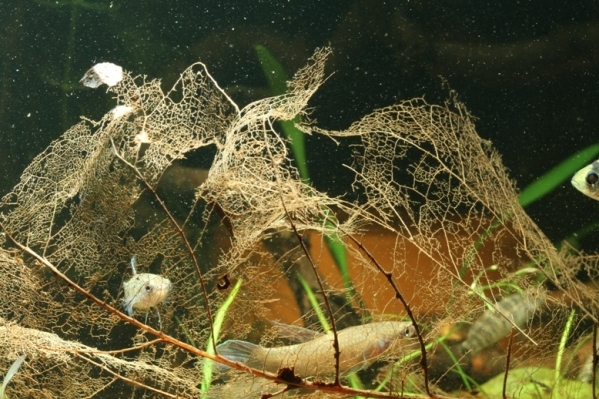 In fact, it has been said that many fish collectors will not even bother to get their nets wet if there is no leaf litter on the substrate if searching for certain species. The leaves make up a huge matrix of an aquatic habitat and as many as several hundred Apistogrammai spp. have been recorded per square meter of leaf litter. The crux of the matter really has to do with the tannins which are released from the leaves and this is not a new notion as some companies have been selling blackwater extract for years for use with suitable fish. 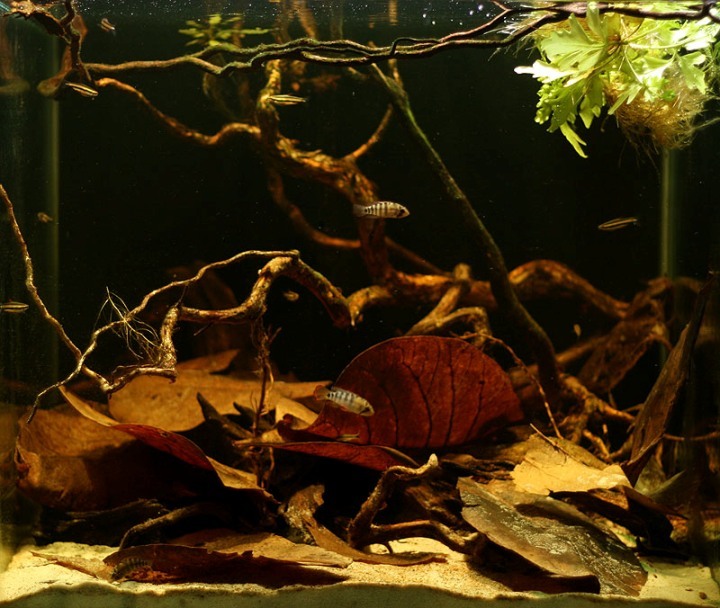 Adding dead leaves will have the resulting effect of releasing humic substances and this will lower the pH of the aquarium water, act as an anti-bacterial and anti-fungal agent, and also lower the heavy metal content of the water. It is widely accepted that it acts as a spawning trigger and can aid in the recovery of any fish damaged through stress or fighting. From my own observations and with the backing of some scientific research by the likes of Dr Christian Steinberg, it has been proven that there are many positive reasons why using humic substance releasers, such as dead leaves, are good for the aquarium fish we keep. One further point that I’d like to stress is that a layer of leaf litter in the aquarium will start to give the water a weak yellowish-brown tinge and this is a good indication of just how much humic substance is in the water. It cannot be tested with an off-the-shelf test kit so it really is best done by the eye. If the water starts to go brown then I usually decide that I have added too much humic substance and cut back a bit. Some people will actually have a spare bucket filled with water where they add a lot of leaves or alder cones and use this as a concentrated solution. You can then remove water by the jar-full and add this to the blackwater tank until it is the right “colour”. You will find that blackwater fish will do much better and be less shy in tanks where the water has a tannin stain and subdued lighting also helps. Yes, there is more… I had my suspicions that having dead leaves in aquariums was actually acting as a food for some fish, particularly with fry. 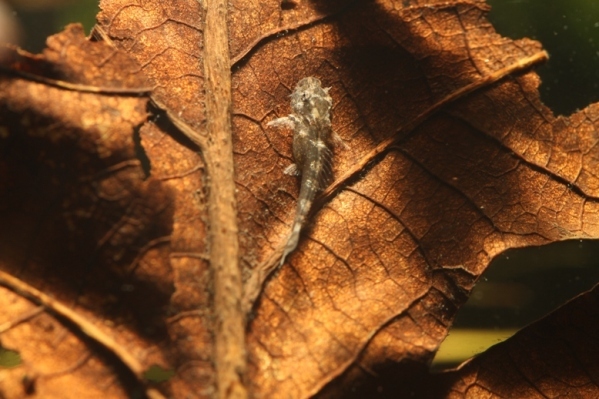 I was able to witness that fry in tanks with leaf litter seem to grow bigger faster and I could often see the young fish grazing on the leaves. I had assumed that it was the leaves themselves that were being eaten but while reading the TFH book, “Culturing Live Foods”, Michael Hellweg makes reference to using dead leaves from hardwood trees as a method of feeding larval fish. He explains that blackwater habitats are characterized by having large amounts of leaf litter and very low pH and that there are relatively few planktonic animals on which young fish can predate. Some fish species get round this problem by excreting large amounts of slime from their bodies for the fish to eat (discus, uaru etc) and this can sustain the young fish for several weeks. As dead leaves are broken down by bacterial and fungal action they produce a slime and it would seem that this is what the baby fish are feeding on. I have certainly had high survival rates from loricariid fry where leaves have been present. Lastly on this subject, the leaves also seem to kick-start infusoria populations, again perfect for feeding tiny fry. 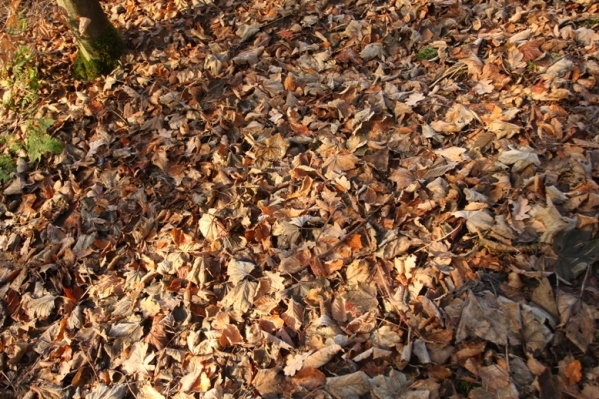 The most important issues when it comes to using dead leaves are in their identification, collection and preparation. It is important to only collect leaves that have fallen from the trees and are not fresh living leaves. During the autumn the deciduous trees start to shut down for the winter and the leaves which have worked as factories all through the spring and summer months producing sugars and oxygen are gradually killed off and fall to the ground. These are the leaves we want to collect as they have no living matter in them that could cause problems in the tank as they die. If you don’t know your tree species then it might be worth getting a hold of small pocket guide to trees so you can try and get the right species and it makes sense to try and collect the leaves in areas away from roads and any other sources of pollution. You should also try to avoid any that are overly dirty in mud or perhaps covered with bird droppings. Typically I fill several bin bags with leaves and take them home to dry them out. You might want to dry them out in the garage or a fish shed if you have one because it is quite normal to have stowaway spiders and other minibeasts which you might not appreciate moving into your house. I collect enough leaves in the autumn to see me through to the next year and store them in a dry environment tied in large fish bags or similar once they are properly dry. Do not boil them in water before use. Yes, you will sterilise them but it will also boil off a lot of the beneficial reasons that we want them for in the first place. I just add them to the aquarium in their dried out state after their correct storage. The leaves will naturally float but most will have sunk within twenty-four hours or so. There are no rules as to how much to add so it will need some trial and error. Much of this will be influenced by the species of leaf as some contain more tannins than others. For example with beech leaves I could add a few inches of leaves with only a slight staining of the water but more than four or five individual leaves from Indian Almond trees and the water will look like tea! You do not need to remove the leaves after a period of time as they gradually break down altogether and can be simply replenished by adding more to the tank. Some leaves will last much longer than others and again using my two earlier examples; Indian almond leaves may only last a couple of months whereas beech leaves may take more than six months to break down. In closing, at a time when we should all be more environmentally aware and realise that the traditional method of staining water, peat, is a valuable habitat not to be destroyed, that I have found the use of dead leaves to be environmentally friendly, cheap, interesting and overall valuable in the keeping of any fish I have had which would naturally require blackwater, soft, acidic conditions and recommend that you give them a try, perhaps starting with the easy to obtain Indian almond leaves and then move on to some locally found species. Hi Johnny, the best leaves to add in that case are from the beech tree or beech hedges; Fagus sylvatica. They are a lovely colour and break down slowly. They also release the least amount of tannins which stain the water. Do you happen to know if also the leaves of the genus Magnolia (particularly from Magnolia grandiflora) are suitable for aquariums? Do they colour the water a lot? I find them beautiful and quite interesting. I also have an interest in Dendrobatid frogs and Magnolia leaves are very commonly used in vivaria/terraria housing these delicate little amphibians. They are useful because the leaves are large enough to hold small amounts of water where the frogs may place eggs/tadpoles for a while. Many of the best dart frog terraria have a system where the water is constantly moving through a waterfall, over some of the substrate and back into a reservoir, so the water will pass over the leaves on a regular basis. I have never used the leaves personally but “dart frog friends” do and if they were toxic then sensitive dendrobates and their tadpoles would not survive in water stained by them. They are a tough leaf and I’d imagine that they would take a long time to break down in the water. In another month or so I will be visiting a local arboretum to collect different oak and beech leaves (as usual) and I’ll be sure to look for a Magnolia or two to try their leaves this year. Thanks for the interesting information about the beneficial properties of leaves, also for vivaria/terraria use. I would personally use them for fish aquariums. I would like to try them, not only because I have trees nearby, but also (as you said) because they are very tough leaves and quite big. They would probably look lovely and I’m sure they’ll be very useful for fry. I’d like to know how it goes if you will try them out in the future. I have never had a problem with tannins staining anything in my tanks. Can’t say I have ever heard anyone mention that to be a problem either? hope that helps a bit? I have copper beeches in my garden, I was wondering other than ensuring the leaves are dry is it fine to use them straight off the ground. I thought they might need to be baked? My water is fairly soft already could it cause a ph crash? Yeah copper beech is totally safe – it’s the same species as the regular green one. Just pick the leaves up, dry them off naturally and then use them. Avoid leaves that are on a busy road or likely to be contaminated with any other pollution. Beech leaves are not going to cause a pH crash by themselves, they will add humic substances which are naturally acidic but regular monitoring of the pH should help to avoid any crashes. Thanks Colin. My fish are loving them already and they look a beautiful red brown in the tank light. Would anyone know the species of the fish in the first photo? Hi, the fish in the main image at the top are Apistogramma baenschi. Thank you very much. I was racking my brain for houses on that. I like the article and I use leaf litter quite often in my aquaria. But I am a bit surprised the article doesn’t warn for the drawback of the use of leaf litter to augment the DHS in the aquatic environment. The main issue with augmenting the Humic Substances in your aquarium is when the fish get sick and you need to treat with medicine. Many medicine are oxidators and they react with HS and lose their functionality. You could compensate for this loss of active medicine by overdosing but for now we don’t have a cheap way to measure the reduction potential of water enriched with HS. For most diseases the solution is simple. Use a quarantine aquarium to treat your fish. It gets more complicated when you have to treat infectious diseases with active stadia out of the fish, like Ichthyophthirius multifiliis (white spot disease). In that case it is best to reduce the amount of HS before starting the treatment. 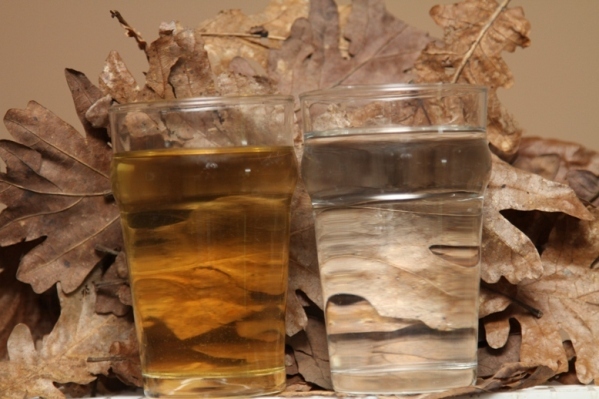 So temporarily removing all the leaves and changing at least 50% of the water is necessary before you start treatment. Keep the HS low until the disease is fully treated. Which ones are the darkest out of the ones you used. Question: I would like to collect some oak leaves right now – but it is Feb. 3 (northeast NY winter) and I am not sure if this is an OK time to collect these leaves? I realize that the best time to collect leaves is in the autumn. If I do collect these leaves now – is there anything special I need to do in order for them to be safe/beneficial for fish (betta). Question, how about algea with so much dead material in the aquarium. Doesn’t the blue green algea appear? And how many waterchanges do you (%/week) do in this setup? Thx! Algae won’t be a problem in my experience. Blue green algae usually appears when there’s a lack of nitrates in the aquarium, so essentially actually a lack of nutrients, and an excess of phosphates. This is due to it’s ability to fix nitrogen from the air and thus has an ability fo fluorish under conditions where plants and other algae can’t.